Programming Beethoven alongside contemporary music sometimes creates stylistic friction but also enriching dialogues. 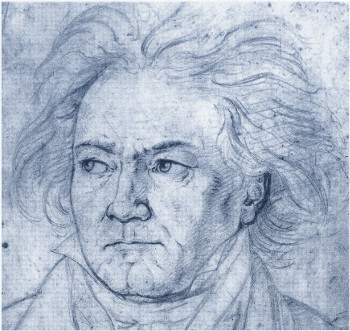 The majority of contemporary compositions contrast strongly with Beethoven's symphonic oeuvre. The real challenge, however, lies not in finding contrasting works, but in the programming of Beethoven's symphonies with mutually reinforcing orchestral works that are similar to the compositional goals of Beethoven. The symphonic debuts of Ludwig van Beethoven (1770-1792) and Elliott Carter (1908-2012) may be almost a century and a half apart, however they are connected by their kindred artistic spirit: the architectural execution of the musical form, the development of larger sections out of small motivic cells and the fondness of playing with metric shifts. Both symphonies are typical works of their time; though at the same time show us the seeds of further development. Both Beethoven and Carter deviated from a traditional path and were regarded as radical innovators. While writing his second symphony, Beethoven was confronted with the loss of hearing. It made him even more aware of his frailty and mortality. However, his second symphony doesn't reflect this suffering and anxiety, but presents a calm beauty with brightness and energy. Ernst Bacon experienced the depression of post-war Europe first-hand and was directly confronted with the pessimism of the avant-garde. However, that didn't translate directly in his music. He chose a cheerful American jazz and folk-inspired style for his second symphony. The often suspected causality of the emotional state of a composer and his artistic achievement is thus falsely emphasized. The combination of both Beethoven's and Bacon's second symphonies is a reason to reflect on it. Beyond that, Bacon's second has the same Beethovenian vehemence. March music and selections from speeches by Napoleon form the basis for the programmatic work Three Fanfares for the Proclamations of Napoleon by Jaques Castérèdes. These fanfares frame the Eroica, originally dedicated to Napoleon, within its genesis and function as a fitting prelude. In the first movement, the narrator quotes Bonaparte's proclamation to the winning troops of the Italian campaign of 1797. Subsequently, Castérède makes a leap in time and recounts Napoleon's historical speech 'Adieux De La Garde' (1814). In the third movement the defeat of Napoleon at Waterloo (1815) becomes audible. This last fanfare can lead directly to the two sound blasts opening the third symphony. Robert Schumann saw the fourth symphony as 'classic in its proportions, well-made, beautifully wrought, worthy to be ranked with the ideal of noble simplicity in classical art that the Romantic period inherited from the Enlightenment' (—Lewis Lockwood). Pine Tree Fantasy by Walter Piston could be defined as neo-classical in its clarity and its harmonious relation of parts. It evokes a similar world of Romantic feeling to the fourth's opening adagio. The composer dedicated Towards Freedom? to Amnesty International. Towards Freedom? has two alternative endings, the first is quite ambiguous according to the question mark in the title, and the second is clear and optimistic. The programmer can choose to perform one version or play the piece twice with alternative endings in the same concert. The 'fight' for the right ending is also a formal aspect of Beethoven's fifth symphony. The famous timpani-grounded transition to the final movement is also played twice. Beethoven's light and summery music with the song of shepherds finds a complement in Symphony by Hans Abrahamsen. The first movement of Symphony presents joyous material, immediately reminiscent of 'the awakening of joyous feelings on getting out into the countryside' (as Beethoven marked his first movement), which then is expanded within the frames of the classical sonata form. The second movement of Symphony is a sound-weaving of polyphonic lines in which the pastoral references are more and more processed and in which the programmatic idea disappears in favor of absolute music. The last movement of the thrilling seventh symphony, often associated with dance, made Carl Maria von Weber think that Beethoven was 'ready for the madhouse'. For those who want to see an orchestra go into overdrive, program New Era Dance by Aaron Jay Kernis after the finale of the seventh. New Era Dance was written in anticipation of the new millennium's arrival in 2000. Brief, concentrated, energetic, witty — these attributes apply to both works. Oliver Knussen writes: 'Drala is one of Lieberson's best-known pieces. For me in the music of the late 20th century there is no passage of such tender beauty as the Invocation at the very beginning of the piece. This passage is the starting point for a clearly structured symphonic journey to the monoritmica-finale which is both climax and antithesis for the beginning. For the orchestra Drala is a tour de force in all meanings. The piece deserves a steady place in the repertoire'. In Pièce sans titre 'Muss es sein?' Henri Dutilleux refers to the famous question 'Must it be?' which Beethoven wrote in the score of his sixteenth string quartet, and makes it the motto of his composition: an untitled work with an open ending. At the world premiere in 2000, Pièce sans titre 'Muss es sein?' was programmed as a prelude to Beethoven's ninth symphony. Dutilleux considered that the symphony could not be 'preluded' by fanfares. So, he envisioned a piece that would evoke a sense of contemplation through the distant evocation of chorales. Pièce sans titre 'Muss es sein?' imposes like that a meditation on the ninth symphony.